I hate hospitals « You know… that Blog? Wee one had me rushing her to the hospital last night at 11pm, complaining of pain in her nether regions. I was hoping she would fall asleep and I could take her to our regular (female) doctor this morning, but she slept for a total of 30 minutes and woke up screaming, which is extremely unlike her. I tried bathing her and put a barrier cream in the area, dosed her with Tylenol – nothing helped. So in we went. I dread going to the small hospital we have in our town, even though wait times are half what they are generally in the larger, more densely populated cities, I knew it was going to be a very late night. Things were actually quiet when we pulled in – very few cars in the parking lot – a great sign! …and I found something to read. Wonder how many sick people have touched that over the past 27 years? I should explain that spending time in a hospital with Wee One is a major thing. 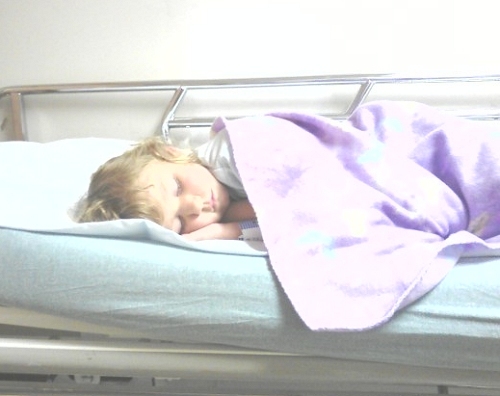 When she was a year old exactly (we spent her birthday night in the hospital) she developed a raging UTI and of course, since it was late at night, we had no option but to head to the hospital. Over the course of 2 hours, three different nurses, including a ham-handed male nurse, tried to insert a catheter into my sick wee girl, and she had to be physically restrained. She was so little she had no idea what they were trying to do to her. I finally couldn’t take it any more and made them stop. She was hysterical, and they kept wanting to poke at her. It was beyond horrible. From that day on, my sweet baby girl has never been the same. Even me changing her diaper was a recurring trauma for the next few months before she was potty trained. We’ve dealt with extreme shyness issues, and seeing any sort of medical equipment or doctor sends her into shaking hysteria. I’ve been working with her for a long time to get her to overcome this abject fear, and she has made huge improvements. She’s still very shy, but not paralyzed by it, and because I’ve made a point of taking her with me to our wonderful female doctor every time I go in for anything, to get her used to the fact that doctors are there to help, and they are good people, she has slowly begun to relax about that. This in mind, her asking me to take her to the doctor – any doctor – last night meant she was in real pain. The lone doctor in our small hospital emerg department finally wandered in around 3am, and was able to examine Wee One without her even waking up (YAY!) We left with a prescription shortly after. I was so thankful she was able to sleep through it, and won’t have yet another memory of being examined in her nether regions in a hospital. Wee One will be fine – she has her first female malady, very common in little girls, which is easily cured with some TLC and a topical cream. What a blessing that she was able to sleep through the examination. One of the hardest things as a Mother is to see our children suffer. I hope wee one has a speedy recovery. Your such a wonderful and wise Mother. Your girls are lucky! Poor Wee One! I am glad her problem was an easy fix. And extra kudos to the doctor for not waking her up during the exam. It is so hard to see our kids sick! I have had [quite] a few not so great experiences with the Military Hospital here. So many in fact, that I would rather treat my kids at home the best I can than risk taking them there and having them misdiagnosed or treated like garbage. I can’t wait to be back on the mainland so we have better options for healthcare. Anyways, I hope you guys have a great day and get in some nap time! .-= Jessica @ Mental Vomit´s last blog ..Project 365 [Day 33] =-. I think you win the prize for oldest waiting room reading material that’s for sure!! Glad you got some meds for her, sorry it was such a looooong night! .-= Mighty M Family´s last blog ..order, please? =-. I spent more time in ERs with Ella Numera Una that I care to remember. I’m glad things are going to be OK, but it’s always more than a tad scary to have to rush a kiddo to the hospital…especially in the middle of the night! .-= Melissa B.´s last blog ..Martha Stewart? 2 Thumbs Up! =-. :( Oh, the sadness of it; I’m glad things worked out alright finally. 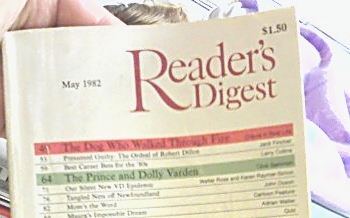 And…Am I seeing a title in that Reader’s Digest about a new VD epidemic?? Yipes. .-= stephanie (bad mom)´s last blog ..appreciation, with an outrageous french accent =-. How frightening! Glad she was able to sleep through the exam – a sign you’ve helped her through her fears. All the best! .-= slacker-chick´s last blog ..Six Word Saturday: Watch Out! =-.